Now that the install is complete, and he’s had some time to experience it firsthand, Andy tells us, “I’m really happy about the kiTCurve12s because the 12-inch drivers provide a big full range response even without subwoofers. The speakers also provide excellent coverage in a room that is very wide with very little perceptible SPL and frequency drop off. There’s superb headroom and the kiTCurve12s are consistent from low to high volume. Mixing is super easy. I’m more than pleased with how our new Clair Brothers system performs.” In addition to the kiTCurve12s, LIFT AV also installed four individual Clair Brothers 18-inch CS18-II subwoofers because of their low height/high power capability (The subs were required to fit under a fairly low stage cap). 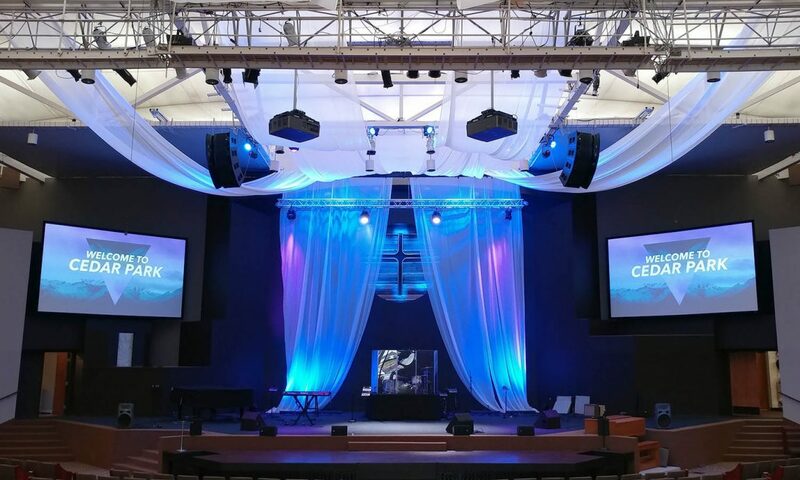 Clair Brothers/Lab.gruppen high-powered multi-channel amps were used for the kiTCurve12s and subs, while an Allen & Heath dLive S7000 console was installed for FOH and a dLive C1500 was put in the auditorium’s broadcast room. Also included in the FOH system is a Waves Sound Grid for additional Waves Plugins.